The 33rd express entry draws since the visa program began in 2015; the Canada Express issued 799 PR invitations to the prospective migrants who secured 534 points in the comprehensive ranking system. The CRS score significantly decreased increased from 468 to 534. 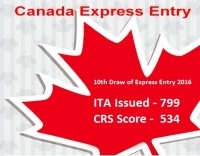 The comprehensive ranking systems score in the year 2016 did not cross the 500 mark in the last nine express entry draws in the current year. However, the significant increase in the score and the decrease of PR invitations is the new trend in the present express entry draw. The Canada Express Entry has managed to welcome the qualified professionals. The system is likely to undergo drastic changes as the Liberal Government announced revamping the Canada Express Scheme. The comprehensive report of the Canada Express Entry for the year 2015, revealed the new trend of migration to the United States. The skilled migrants preferred the Alberta, Ontario, British Columbia for finding jobs. The express entry scheme is the economic migration program of Canada and invites applicants based on the valid CRS score. Valid Job offer is mandatory to Apply for the Canada Express Entry, but the express report suggests that the permanent residence is issued to the candidates even without the job offers.